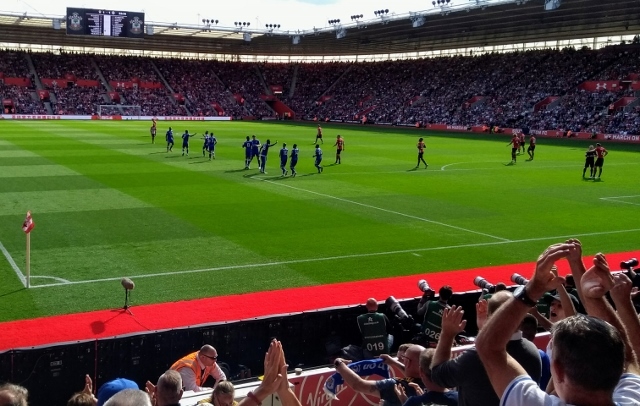 Goals by Demarai Gray and Harry Maguire – their first for Leicester City during 2018 – gave the Foxes a 2-1 victory at Southampton, to the delight of a travelling contingent numbering nearly 3000. However, the side's performance, as in the previous victory at home to Wolves, was far from fluent during long spells of the game, and the eventual result owed at least as much to the home side's capability for self-destruction as to the quality displayed by the visitors. The recall of Kelechi Iheanacho to the starting line-up to replace the suspended Jamie Vardy brought little surprise, but the reinstatement of captain Wes Morgan and Daniel Amartey, for Jonny Evans and Marc Albrighton respectively, raised many an eyebrow among visiting fans. City were content to sit deep for long spells of a scrappy and disjointed opening half, in which neither side were able to maintain possession for long spells. On the rare occasions they ventured forward, opportunities for a break were too often wasted by simple passes going astray. However, the home side were only able to muster two meaningful efforts at goal before the interval, with Kasper Schmeichel being forced to smother efforts by Elyounoussi and Ings. 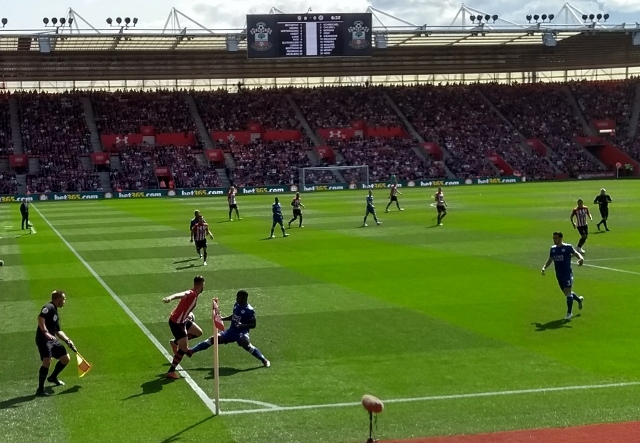 City's best attempts came when Wilfred Ndidi headed over from a corner and Gray miskicked wide from close range. The only other first-half incident of note came when home midfielder Hojbjerg was booked for a petulant pull on the shirt of City counterpart James Maddison, This incident was to assume greater significance later in the afternoon. Both sides stepped up the tempo as the second half began, with Schmeichel foiling Ings again and Ricardo Pereira forcing home keeper McCarthy to save City's first shot on target in the game. 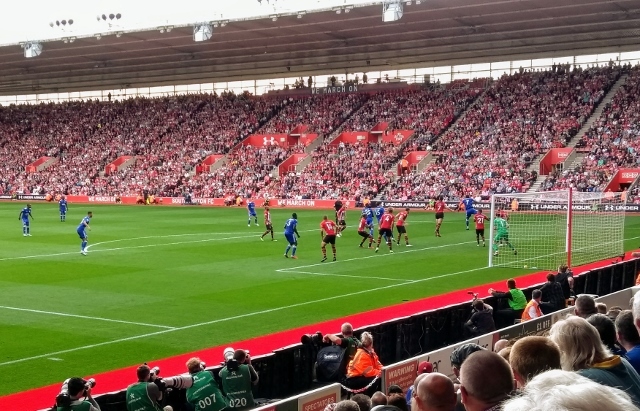 A minute later, though, the home side made the breakthrough, as Bertrand took advantage of defensive dithering to fire a fierce shot from 18 yards which gave Schmeichel no chance. Facing the prospect of a fifth successive away defeat, the Foxes needed to respond quickly, and were able to do so when Gray pounced on a weak headed clearance by Cedric to force home the equaliser. This display of marksmanship – not something for which Gray has been renowned during his time at City – impressed the watching Claude Puel sufficiently for him to be switched to a central striking role, with Albrighton coming on for the limping Iheanacho. Tackles flew in during the closing stages as both sides pressed for a winner. Then, with 13 minutes remaining, came the moment that turned the game in City's favour. Hojbjerg intercepted a wayward ball from Ndidi, only for his touch to let him down as he entered the box. The Norwegian then fell to the ground and was confronted by an angry Amartey who judged, along with most of the City fans, that he had taken the most theatrical of dives. Referee Moss agreed and issued a second yellow card to Hojberg, sending him for an early bath. This action, together with the predictably enraged response from home boss Mark Hughes, brought wry smiles from those recalling the key roles played by both referee and manager in previous Vardy red card incidents. City then took the initiative for the first time in the game, with McCarthy thwarting Ben Chilwell and Gray seeing a header deflected inches wide. 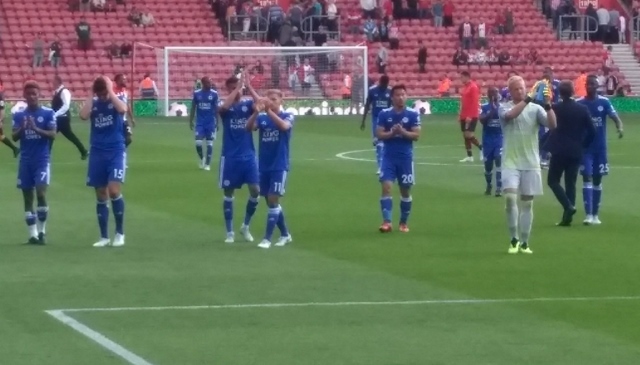 With two minutes of normal time remaining, Puel belatedly brought on Shinji Okazaki for his first appearance of the season. Although his introduction was greeted warmly by the Foxes faithful, many wondered whether it had been unduly delayed. 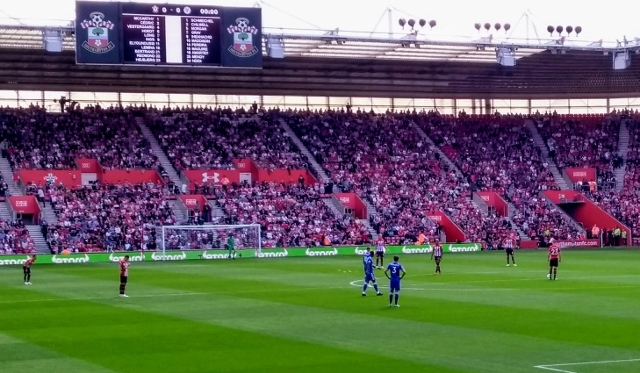 However, the sub's presence ultimately produced the desired impact, as two minutes into stoppage time, Maguire ventured forwards and sent a low 20-yard drive through a crowd of players to beat McCarthy at his near post. There was still time for the hosts to threaten a dramatic flourish of their own, but Redmond's freekick failed to clear the City wall, and Moss immediately brought proceedings to a close. For the third time under this manager, City returned from the south coast with three points. With a fourth trip looming next month, it is to be hoped that the winning run can continue. Despite the encouraging results in the early stages of the campaign, Puel's side still remains very much a work in progress. Iheanacho needs to assert himself more in attack, the right-back position remains as vulnerable as it did with Danny Simpson in the role, and key players need time to adjust to the intensity of English top-flight football. There is also the question of how to integrate the summer's two expensive defensive acquisitions. If the manager proves able to resolve these issues, his position should be secured, and so should City's in the league's top half. 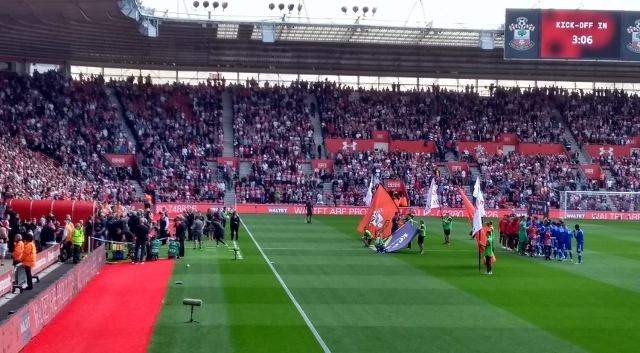 Southampton (4-4-2): McCarthy: Cedric, Vestergaard, Hoedt, Bertrand (c); Elyounoussi (Romeu 79), Lemina, Hojbjerg, Redmond; Long (Armstrong 86), Ings (Austin 69). Subs not used: Gunn, Stephens, Davis, Ward-Prowse. Booked: Bertrand. Sent off: Hojbjerg. City (4-2-3-1): Schmeichel; Amartey, Morgan (c), Maguire, Chilwell; Ndidi, Mendy; Pereira, Maddison (Ghezzal 79), Gray (Okazaki 88), Iheanacho (Albrighton 67). Subs not used: Ward, Evans, Fuchs, Silva. Scorers: Gray (56), Maguire (90 + 2).